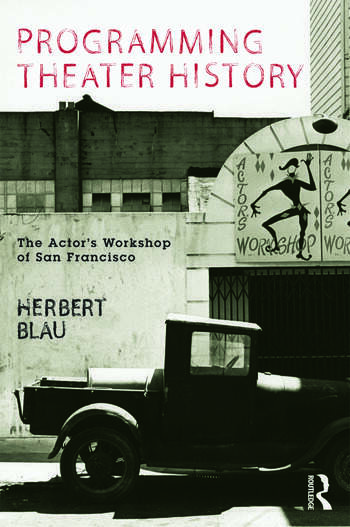 Herbert Blau founded, with Jules Irving, the legendary Actor's Workshop of San Francisco, in 1952, starting with ten people in a loft above a judo academy. Over the course of the next 13 years and its hundred or so productions, it introduced American audiences to plays by Brecht, Beckett, Pinter, Genet, Arden, Fornes, and various unknown others. Most of the productions were accompanied by a stunningly concise and often provocative programme note by Blau. These documents now comprise, within their compelling perspective, a critique of the modern theatre. They vividly reveal what these now canonical works could mean, first time round, and in the context of 1950s and 60s American culture, in the shadow of the Cold War. Programming Theater History curates these notes, with a selection of the Workshop's incrementally artful, alluring programme covers, Blau's recollections, and evocative production photographs, into a narrative of indispensable artefacts and observations. The result is an inspiring testimony by a giant of American performance theory and practice, and a unique reflection of what it is to create theatre history in the present.